What do people want to know about travel? What to write? In the past, I’ve always gone on and on with details, details… but does anyone read that? My trip started with a minor tragedy: the LCD screen on my camera cracked in transit. Luckily, I could borrow my friend’s camera while I was staying with her (she went to her French classes at the Sorbonne while I explored the city), but most of my photos are on her computer awaiting transfer to me. Let me start with her neighborhood: Belleville (of “Triplets” fame), working-class, ethnically diverse, very close to Rue Oberkampf’s hip bars. 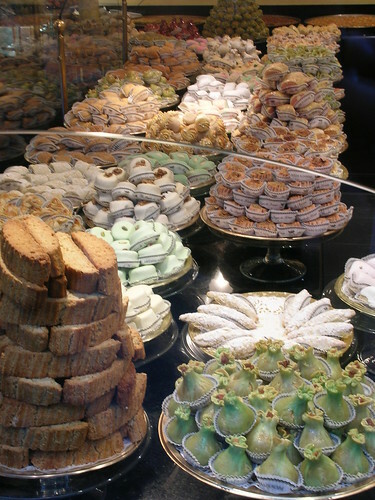 Nearby her apartment is an Algerian patisserie, Bague de Kenza, with meters of counters piled – piled! – with sweets you’ve never seen before! I didn’t get the chance to try any, the one time I went in I was tired and overwhelmed by so much choice. They were selling a cookbook written about their shop, but only in French. Anyone know a good North African pastry cookbook in Anglais? On Tuesday, I woke early and went out to the vegetable market that takes over the center of Boulevard de Belleville twice a week, came home with little bags of tomatoes, crusty rolls, pamplemousse (grapefruit), sweet rolls, bananas. It was like and unlike Turkish markets, covered, colorful, crowded to near bursting with shoppers and vendors, cacophonous. I could easily ask for what I wanted but could never hear the price correctly and had to just guess and hold out coins out on my palm. Then they’d laugh and switch to halting (or, occasionally, excellent) English and I’d laugh along. Everywhere, I always started interactions with French, as often as not got French in return, at least until I got stuck. I was brave; I started with almost none but tried out what I had and what my friend taught me, and by the end could ask for L’addition, s’il vous plait, or Un carafe d’eau, or Je voudrez un pain d’chocolat. (I think my spelling might be awful, though). The biggest triumph was asking for 15 postcard stamps at the Poste: Je voudrez quinz carte postales, s’il vous plait. I might have asked for postcards rather than stamps but the point was entirely communicated and out came the postcard stamps. Which were huge! I rejected those with a little Hmmmm… and a vague hand wave, and out came much smaller ones. The Poste was on Ile St. Louis, close to Berthillon, where my friend Y. had sent me to get chocolate ice cream. I wandered in one afternoon to find a few people standing at the bar having coffee, and a rather ordinary-looking little freezer full of glaces sitting near the doorway. I suddenly felt shy. I also realized that I didn’t know how to say “cone” or “scoop” or anything useful other than glace and the flavors I liked. Of course he would speak English, especially if the place was famous, but that would take half the fun out of it! The barman looked me once over and asked in French something about glace; I said oui and we walked over to the freezer, where I managed to get two tiny scoops, one of chocolat and one of noisette (hazelnut) on a little cone. Then: everything Y. said was true. It was the creamiest, richest chocolate ice cream! I wandered around Ile St. Louis, bought some postcards in a tiny shop run by a little old women, watched parents waiting for their children to be let out of school, found the Poste. 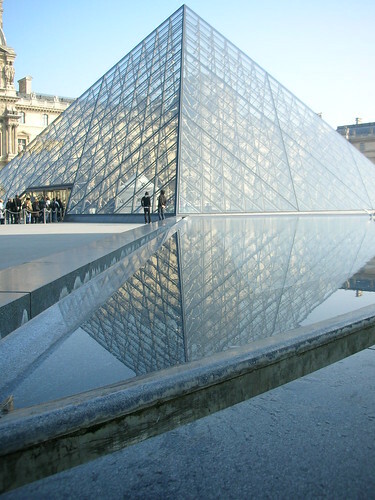 The first day, I saw a lot of art; the Louvre in the morning, the exhibits of modern and contemporary art at the Centre Pompidou in the evening. It was the perfect time to be at the Louvre, because although there were still lines and small crowds around the most famous pieces, the length and breadth of the empty hallways leading up to those pieces led me to imagine what a nightmare it must be in spring and summer. I stuck to the Greek sculpture and French and Italian paintings, found the Venus of Milo more impressive than the Mona Lisa (I just think she has more presence), saw DaVinci’s Madonna of the Rocks with a start of recognition going all the way back to high school art lectures. When I’d had my fill of old art, I walked though the Jardins de Tuileries, sat on a bench near a fountain and enjoyed a cheese sandwich and a cafe – always espresso – in a little paper cup, took lots of pictures, watched the people reclining by the fountain on this glittering February afternoon. One young man asked if he could buy me coffee – I would have accepted but I was very honestly on my way to meet my friend thirty minutes later. I rushed along the Champs d’Elysees to the Arc d’Triomphe, didn’t have time to go up to its observation terrace, and then hopped on the Metro to where I was meeting my friend. (I love the Paris Metro, by the way: the frequency of trains, the little signs telling you the next one will arrive in 2 minutes – and, two minutes later, there it is!, the enormous stations with miles of tunnels connecting one line to the other, the beautiful station signs). Must start my day… many little baking projects await this weekend… a tout a l’heure! *sigh* I miss Paris. Great storytelling here! I’m glad you had a fabulous trip and I can’t wait to see your photos! I read the details, and hungrily! I love hearing anything and everything about Paris! It sounds like you had a wonderful time–I’m so glad! Hope you post more about it and yikes, I hope you can get those pics you took!